Sri Chinmoy served as a spiritual teacher to students in sixty countries across the Americas, Europe, Asia, Africa and Australia/New Zealand. His writings, paintings, lectures, record-breaking feats of strength, meditative concerts and humanitarian activities have inspired individuals from all walks of life. Residing in New York City from 1964 until his passing in October 2007, the Indian-born visionary demonstrated through his own life and mission the integration of inner spiritual disciplines and outer dynamic service to the community at large. He offered prayers and meditations at the United Nations since 1970. The director of an international marathon team, he originated and oversaw an annual global event in more than 70 countries called the Peace Run . RadioSriChinmoy.org – Listen to music composed by Sri Chinmoy and performed by a numbere of different artists. Also find podcasts, plays, daily words of inspiration, etc. 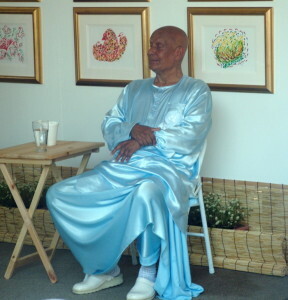 SriChinmoyLibrary.com – A full-text searchable online library of Sri Chinmoy’s writings.